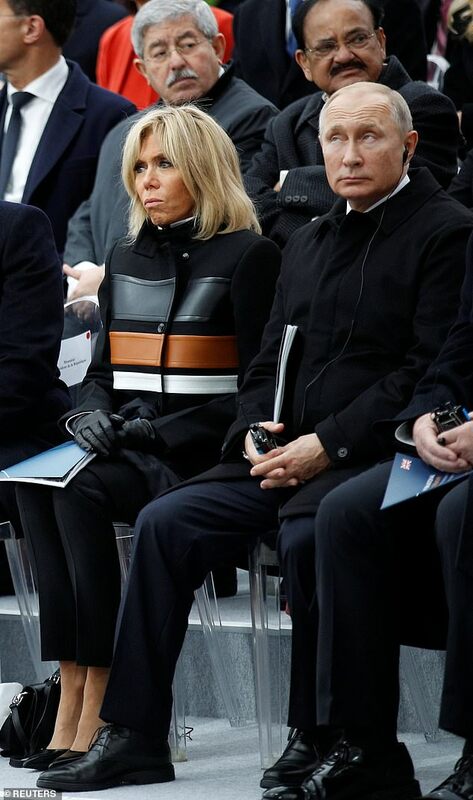 Damn Putin and his Manspreading. Putin earlier " Hope this glue holds my eyelids open!" Putin when photo was snapped "ZZZZZ"
"That had better be our drone." "Post Malone really does rap about real sh*t"
Ladies and gentlemens,we have a winner! He does look like he's rapturously listening to some tunes on that little transistor radio, doesn't he? I wonder if she really believes she's an X Men or just like dressing like one. I dunno,but she has a serious case of "man face",doesn't she? I can't imagine waking up in the morning and seeing THAT face on the pillow next to me. It would be enough to swear off drinking forever. With that expression on her face,all she would need would be minor makeup to pass for a "Planet of the Apes" cast member. Considering Macron is her child/husband one of them has to be a man. And my money is on separate bedrooms. Why would you even wonder? Whatever we think, they are married (unlike most cohabitants currently) and appear to like each other. Whatever they do or don't do in their bedroom is none of our business. Sheesh. Y'all sound like gossipy old men. Well now you've gone and done it. You mentioned the Planets of the Apes. Your tv show on this message board will be cancelled immediately! Darn it...I'll miss your posts. Hahaha remember when Putin gave a thumbs up to a woman's breasts? Yes, Mrs. Macron, I realize you're not Cheryl Hines. You just look like her, that's all!